This flip was all about testing out a few new things I’ve been wanting to try – gray cabinets, a sleek fireplace mantle, an aqua front door . 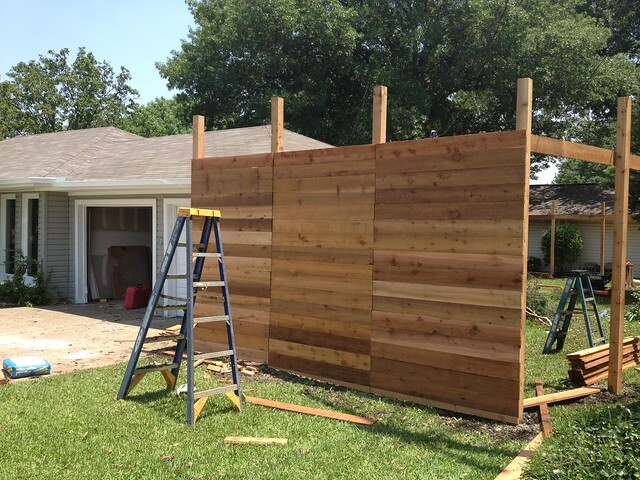 . . and a modern, horizontal cedar fence. Granted, any new fence would have been an improvement over the sad, chain link fence we inherited with the house. 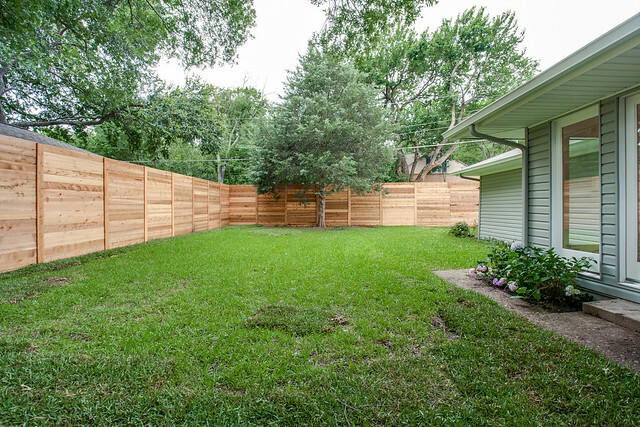 While the existing chain link fence performed the basic function of a fence – keeping things in/out of the backyard – it was seriously lacking in privacy and good looks, and it made the backyard a lot smaller than it actually was since it didn’t incorporate the side yard that you can see in the photo below. What a wasted opportunity! 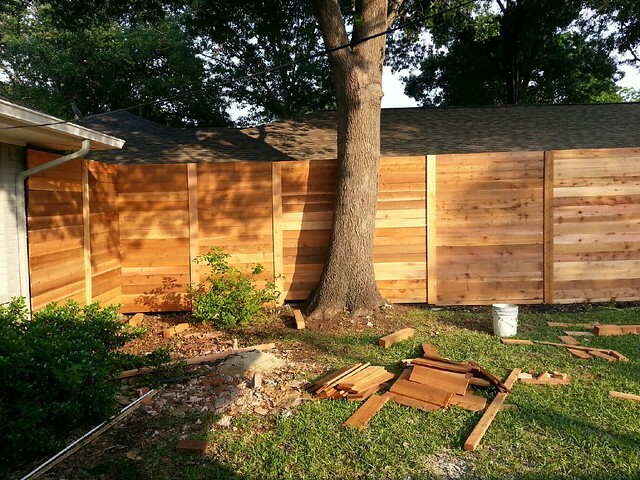 We knew from the beginning that we would be replacing the fence, and got quotes for a 6 foot tall board on board cedar fence with a starter board, like we did here. (Looks like I never wrote a post about that! If you’re interested in one, let me know). But then I drove past a house in my parents’ neighborhood that boasted a snazzy horizontal fence and everything clicked into place – that’s exactly what we needed at this house! We got new quotes for an 8 foot tall horizontal cedar fence and the price difference was just a few hundred bucks so we decided to spring for it. Everything started to look better the instant the fence guys removed the old chain link fence. Then they used a giant auger (that you can see below) to dig holes for all of the cedar fence posts. They leveled each post in a cement footing. We opted for wood posts instead of metal for both aesthetics (they looked prettier) and cost (they were a few hundred bucks cheaper). 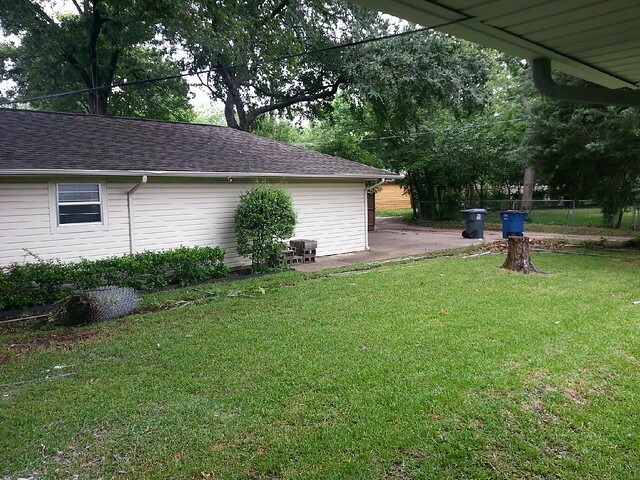 You can see below how we scooted out the fence toward the corner of the property to incorporate a huge part of the side yard by the garage. Once all the posts were leveled and cemented into place, a level starter board was nailed across all the posts. 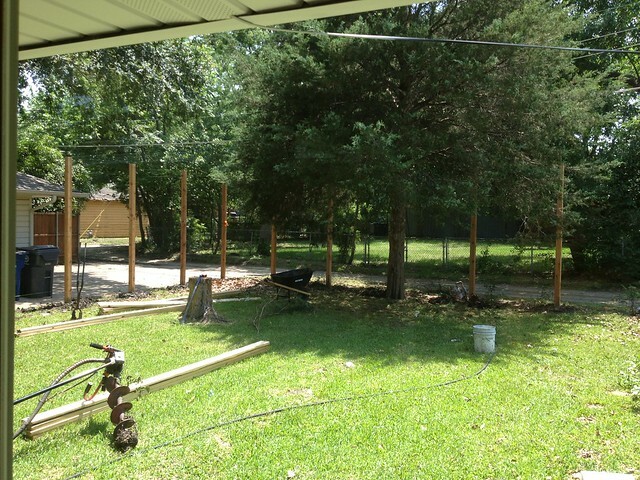 The parts of the fence that are visible from the street are “pickets out” so that the finished, pretty side of the fence is shown to passersby, and the parts of the fence that are only visible from the backyard are “pickets in” so that the homeowners will get to enjoy a pretty view. See how the fencing along the alley in the photo below has bracing in the middle of each panel? 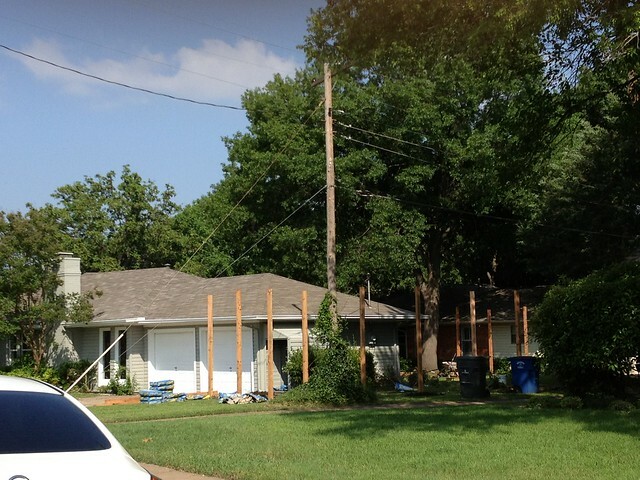 That bracing keeps the boards from warping, and isn’t seen from the street or the backyard. The bottom of this tree (in the photo below) sticks out a few inches past the property line, and the guys did a great job scribing the pickets around the rear end of the tree. The gate to the alley is as wide as all of the other panels – a super gate! Would you ever spring for a horizontal fence? 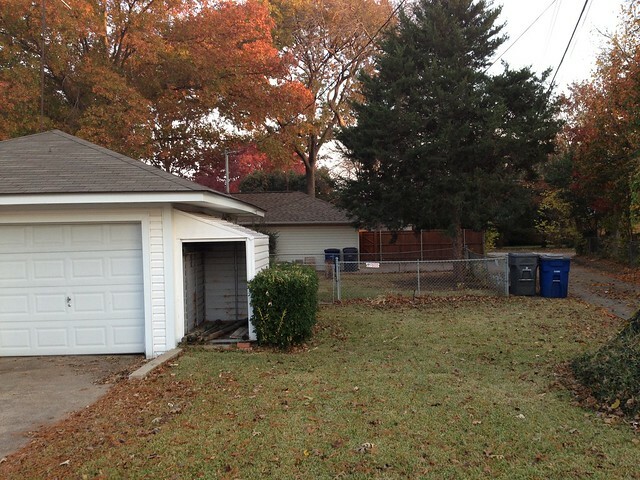 For more photos of this flip’s exterior, click here. I think it looks really good and matches the horizontal boards of the house. It will soften too with more garden. It certainly gives lots of privacy. The fence looks great. My question would be whether it will last. 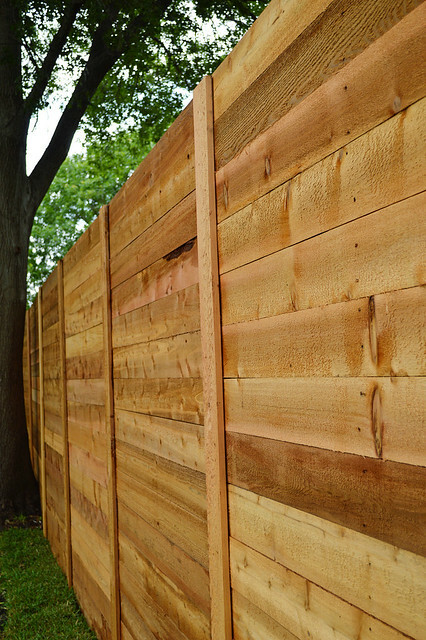 One of the main reasons for having vertical boards is so that rain can run down the fence rather than being caught in the horizontal cracks (as it would be if the boards are laid horizontally). I sure love the look of it, though. 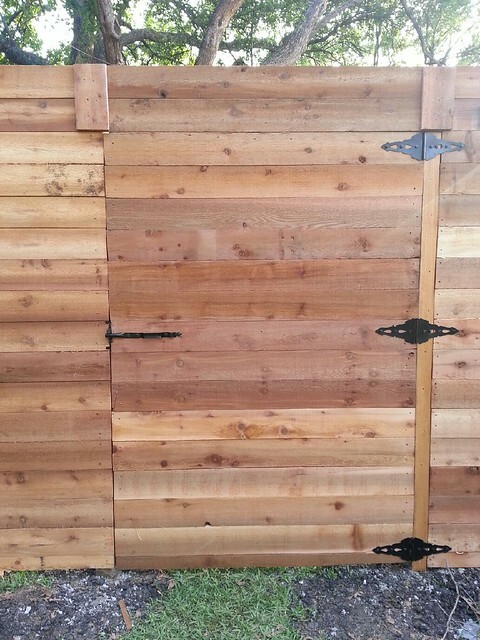 I’ve seen cedar fences, built horizontally like this one, that are fairly old and still look great! I’ve been incredible impressed with your work and more than inspired, this is exactly what I want for my new place, the fence it currently has is sadder than a link fence and I want a really nice outdoor area with tons of privacy and this is just what I was looking for, thank you! This is the first time I have seen a “horizontal fence” and it definitely looks interesting. Is there a particular reason why you didn’t settle on the typical vertical fence? We just love the look of horizontal fences and, since this house is a little less traditional that our past flips, thought it would be a great time to try out this more modern look! I would so do this if I had a corner lot. Our home is nestled between two others that already have vertical fencing so we wouldn’t want to be the odd man out, kwim? 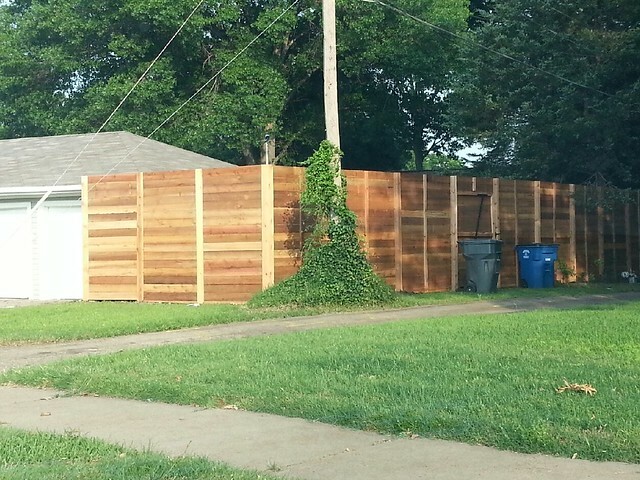 I really love the look of horizontal fencing, and this one looks terrific. I am curious however, as to the choice of eight foot fence rather than 6 or 7max. It seems so high, especially in a neighborhood. The house looks terrific. I have never seen anything like this! It is gorgeous!! Heck ya! it looks awesome Liz!!! Love the horizontal fence… except for the fact that it looks SO tall!? Wow! Is there a lot of crime in this area? It looks almost taller than the garage. Interested in hearing your thoughts on the height. 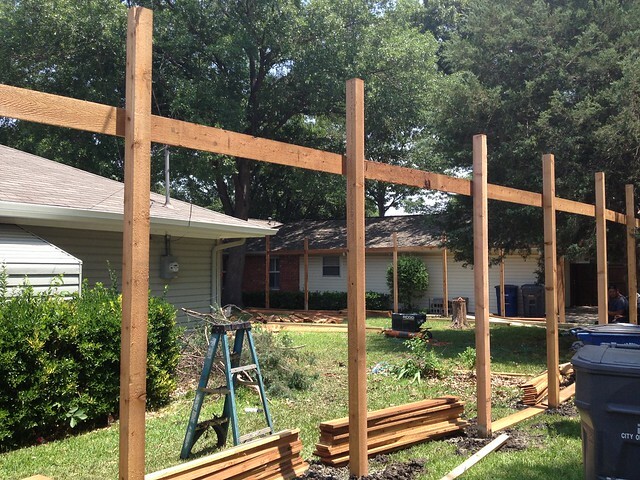 This is so funny – when we first moved to Dallas, I couldn’t get over how tall all the fences were! 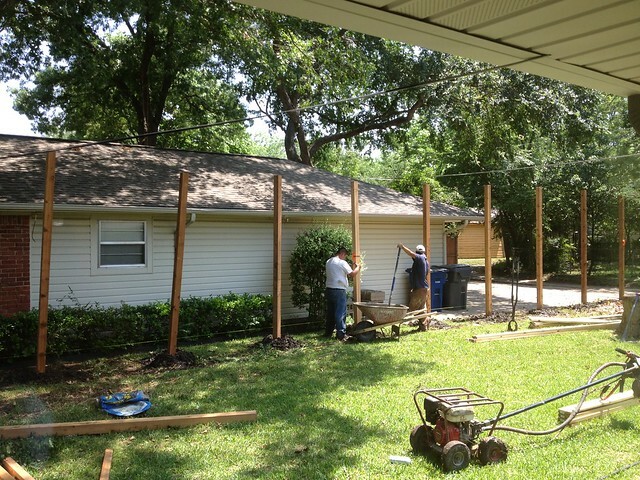 It’s true, 8 feet fences are the norm there! And, I have to say, they do afford much more privacy than the 6 foot I was used to! Love this fence! Mary Dewitte recently posted.. Best Workout Program for you! I really love the look of the horizontal fence, actually I don’t think I’ve ever seen it before. It looks very modern/zen. As far as how tall, 8 ft is totally normal in Dallas, privacy please!!! love it! so modern and fancy. Noemi Bostrom recently posted.. ChaLEAN Extreme Review: How Well Does It Work? 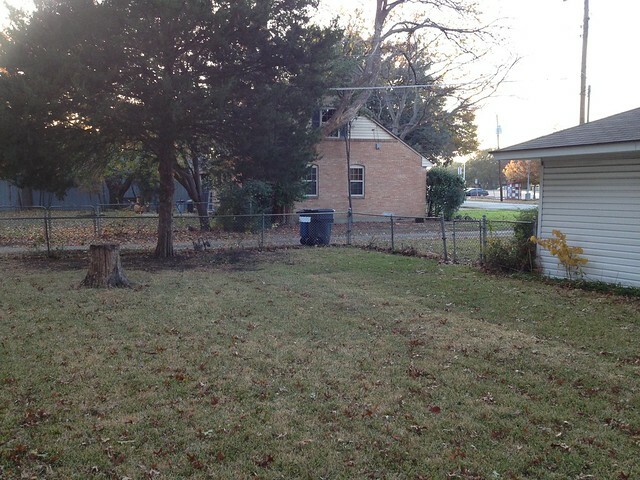 The fence makes a BIG difference…good job guys! Janette Emerson’s latest post.. PureSleepReview: Does It Really Work? Fencing your house by using this kind of technique is like wooow….just love it.